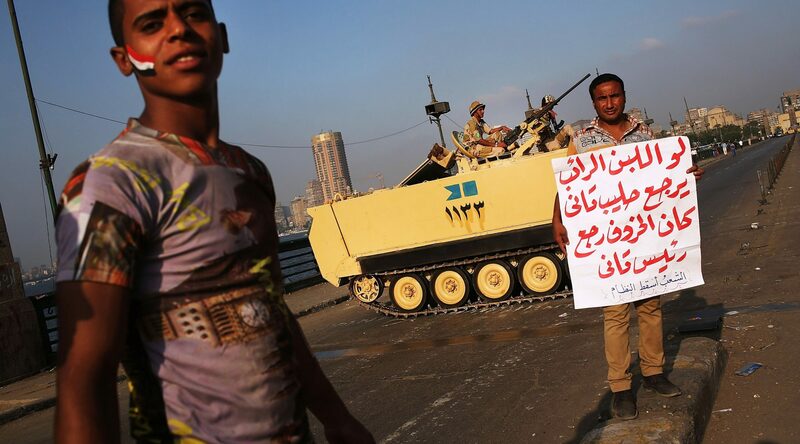 TEL AVIV (JTA) – For the second time in less than three years, Egypt is erupting in chaos, with a popular protest movement leading to a swift change in the country’s leadership. For Israelis, the Egyptian military’s removal of Mohamed Morsi from the presidency last week is a cause for optimism. An Islamist and a leading figure in the Muslim Brotherhood, Morsi’s brief tenure saw a further estrangement between Israel and Egypt. The Brotherhood advocates Israel’s destruction and supports Hamas, the terrorist group that governs in Gaza. And while Morsi upheld the 1979 peace treaty with Israel during his year in office, his refusal of contact with Israel and his warm relations with other Islamist governments portended future tension between the countries. With Morsi gone and the Egyptian military reasserting itself, Israel can breathe a little easier. Israel has enjoyed close cooperation with the Egyptian Army in recent decades, born of their shared interest in combating terrorist groups and maintaining stability. The takeover also poses risks for Israel. A weak and unstable Egypt will be less able to maintain calm in the Sinai Desert, act as an anchor of stability in the Arab world or step in as a mediator between Israel and its enemies. And while dealing with a country led by secular pragmatists is obviously preferable to one led by Islamists, the 2011 Egyptian uprising showed that a government inclined positively toward Israel may only be possible amid significant repression at home. Israel thus far has stayed silent in response to the unrest in Egypt’s capital, neither praising nor condemning the military’s actions nor reaching out publicly to the new government in formation. In an interview last week with the Italian newspaper La Corriere Della Sera, Israeli Prime Minister Benjamin Netanyahu said only that Israel is watching events in Egypt very carefully. Netanyahu also made only passing reference to Egypt in his weekly speech to the Cabinet on Sunday. The Israel Defense Forces also have reacted calmly. Troop activity on Israel’s southern border has not increased meaningfully, despite a rocket exploding last week near the resort town of Eilat and the bombing of an Egyptian gas pipeline to Jordan. Last week, Israel allowed Egypt to move troops into the Sinai — a move prohibited by their peace treaty — as an added security measure. Despite ongoing close coordination between the Israeli and Egyptian militaries, the Sinai has been a hotspot of terrorist activity since Mubarak’s ouster, a situation that could get worse with Egypt’s top brass focused on containing the unrest in Cairo, which already has claimed dozens of lives. In addition to the pipeline bombing, an Egyptian soldier was killed there on Sunday. Morsi’s fall also has weakened Hamas, which enjoyed a small uptick in prestige during his administration. In October, the emir of Qatar became the first head of state to visit Gaza. The following month, Morsi’s mediation of the conflict between Hamas and Israel led to a slight easing of Israel’s Gaza blockade. Now, Hamas again is on the ropes. Its parent organization has been removed from leadership after only a year and it has lost some financial support from Iran for choosing to back the rebels fighting Syrian President Bashar Assad, an Iranian ally. If the Egyptian military clamps down on weapons transfers in the Sinai and underground tunnels to Gaza, it could stanch Hamas’ supply chain. For now, Israeli officials are reacting with a poker face. But if the Brotherhood’s fall portends a decline in Islamist fortunes across the region, Israelis will likely smile and collectively exhale.